Expect to see a lot of the most popular dinosaur of all times this June when you deposit as little as $35 to collect a 100% Match plus 50 Free T-Rex Spins! Yeah, we know dinosaurs became extinct 65 million years ago - but that's no excuse not to spend some time with a Protoceratops, an Ankylosaurs, a Stegosaurus and T-Rex itself this June! Wild symbols that pay doubled prizes, Dinosaur Eggs that open the doors to more Free Spins and a random progressive jackpot prize can all be part of your massive June wins collection when you deposit $35 and up! 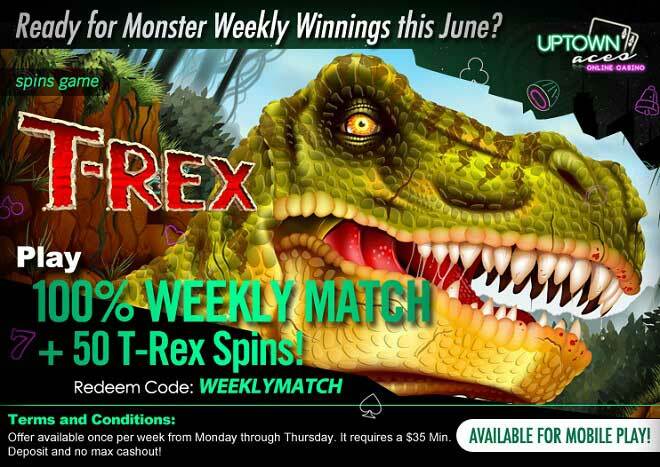 Play 100% Weekly Match + 50 T-Rex Spins!